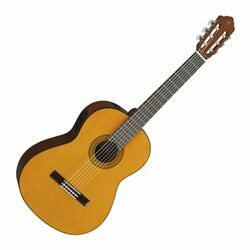 The CGX102 acoustic electric nylon string classical guitar is an expansion of the already popular CG classical guitar series. Yamaha has combined quality tonewoods with an onboard preamp that offers versatile tone control and professional amplification. You'll get a natural, resonant tone from the spruce top, and the rosewood fingerboard and bridge provide you with accurate and smooth response. And, with the new System 68N preamp and precision tuner, the CGX102 will keep you in tune and sounding great if you're playing live. Become a student of the classical guitar with the Yamaha CGX102.